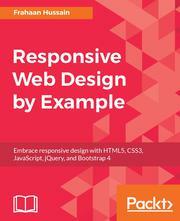 If you are a web developers interested in incorporating responsive web designs in your websites, then this book is for you. Familiarity with HTML5, CSS3, and command lines, though not essential, will help you get the most out of this book. Desktop-only websites just aren't good enough anymore. As you enter a future of increasingly diverse browsing methods, you need to know how to build websites that are presentable and will work perfectly with the huge volume of different device sizes and resolutions that are now commercially available. Responsive web design is an answer to the problem of modern web development. By following the detailed step-by-step instructions, previews, and examples mentioned in this book, you will learn how to build engaging responsive websites and upgrade your skills as a web designer. With coverage of Responsive Grid System and Bootstrap, you will learn about the most powerful frameworks in responsive web design. In this book, you will learn how to create a crisp blog page, a beautiful portfolio site, a cool social networking page, and a fun photo gallery. Through each of these projects, you'll learn how to build various elements of a modern responsive website, and also find out which framework works best for your project specifications. By the end of the book, you will have gained practical skills you need to build real-world websites that are professional, creative and truly responsive. This book conveys the design concepts used to quickly and effectively build responsive websites. We focus less on the theory and more on results, with clear step-by-step instructions, previews, and examples to help you along the way.